Girly Girl Giveaways: Miche Mini PERFECT for Your Summer! Miche Mini PERFECT for Your Summer! Summer is here! The sun is shining, the skies are blue, the air is warm. 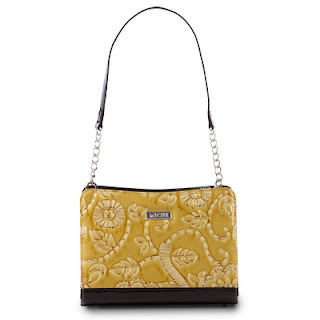 And it's time to upgrade your Miche Mini Shell. You can get your own designer handbags from Miche for amazing prices and without cluttering your closet. Seriously - go check it out! My new Sunny Mini Shell arrived in the mail. New for June is Sunny and she is golden and absolutely beautiful. This is my new favorite shell and I've been wearing it everyday because it matches everything! I have received the most compliments on this bag. Some may call it yellow when viewing it online but it is actually a rich golden hue accented with a black bottom. I love the floral/vine motif in the leather. One particular instance of Miche-envy was when someone at church grabbed my Mini and said, "WHERE did you get this? Is this one of those bags you're always talking about? I LOVE IT!" I showed her how easy it is to take off the cover to replace with a new shell. Why dump out your purse and reorganize every single time you want to change the look of your bag? 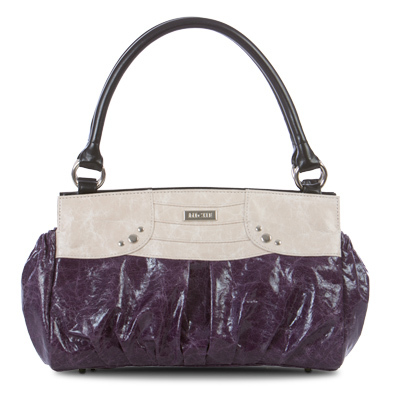 With a Miche all you have to do is change the exterior; not the interior! And with so many amazing choices to choose from you'll always have options no matter your look. I'm drooling over this awesome shell for my classic-sized bag; purple is my favorite! You can find Miche on Facebook and Twitter! I was provided with a free sample from Miche for the purpose of this review.